Gas Cylinder Analysis is available for collecting representative samples of sealing and process gases. Monitoring the Process stream gas and dry box atmosphere are essential for benchmarking initial sealing conditions. Typical applications include: monitoring Helium/Nitrogen mixing ratios, analyzing process stream purity, measuring dry box evacuation procedures and identifying Air/Oxygen leaks. Gas Sample Collection Cylinders are shipped overnight to the client under vacuum. 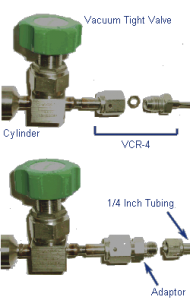 There are several reasons for keeping the cylinder under vacuum: it minimizes possible contamination of the cylinder interior when not in use; it assures that residual gases from previous samples are not mixed with your sample; and it allows samples of unpressurized gases to be collected (i.e., sealer atmospheres, etc.). After receipt of the filled Collection Cylinder at ORS, a Spectra Analysis Report containing the quantitative results will be provided. To order a Collection Cylinder on-line, reply by e-mail to Krista Vivenzo, Customer Service Representative. Please provide your ship-to address and a valid Purchase Order number. The Collection Cylinder will be shipped the same day.